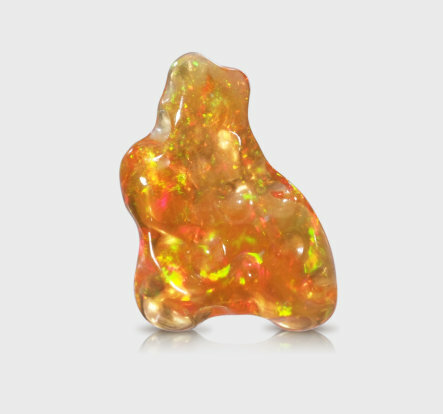 Created by ancient lava flows formed in Mexico millions of years ago, fire opal's reds, oranges and yellow are a reminder of its fiery past. Since all the fire opal mines are located in Mexico, the gemstone is also often referred to as "Mexican Opal" or "Mexican Fire Opal". Although rare, play of color and body color is seeked for and make it more valuable. The bright body color of the opal is due to trace amounts of iron. High transparency combined with strong orange-red colors generate the most breathtaking kinds of hydrated silicon dioxide samples. Fire Opal often forms in soft sandstone nodules. The sandstone is easily removed allowing for amazing freeform shapes. The gemstone is usually left in its freeform state since its natural softness would make any edge less sharp as time passes. Similarly to all other opals, fire opals are relatively soft (5.5 to 6 on Mohs hardness scale) and need to be handled with care.